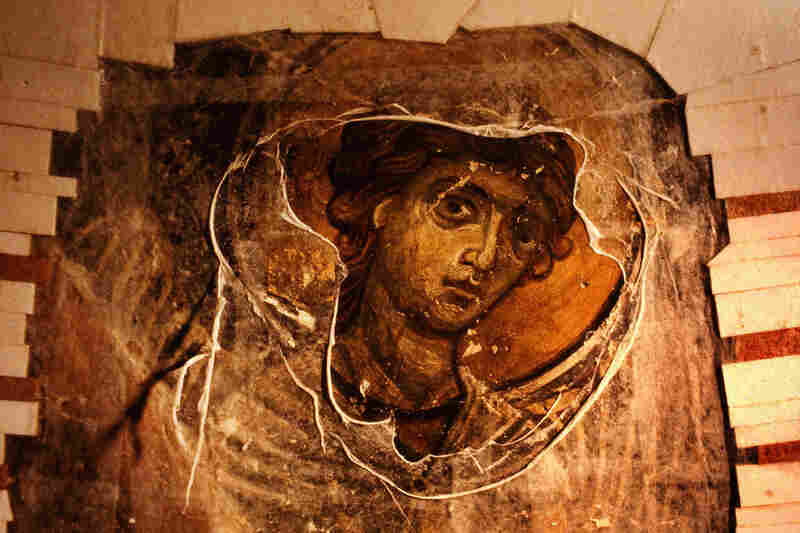 800-Year-Old Frescoes Leave Texas For Cyprus A set of 13th-century Byzantine frescoes — plundered after Turkey invaded the island nation and on display in Houston for the last 15 years — is being repatriated. NPR's Wade Goodwyn reports on the closing chapter in what turns out to be a remarkable odyssey. 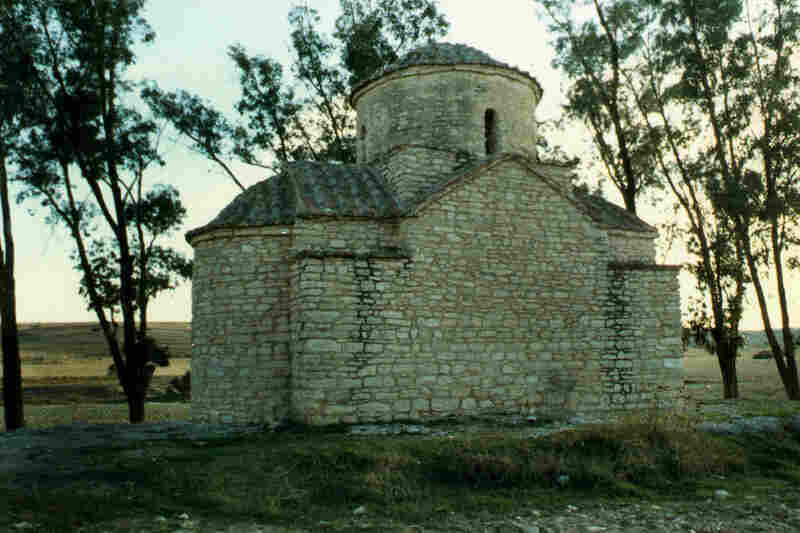 In the 1980s, this 13th century dome was stolen out of the church of St. Evphemianos in Lysi in the Turkish occupied section of Cyprus. The fresco portrays Christ in heaven, surrounded by 12 angels. The archangels Michael and Gabriel flank the Virgin Mary and John the Baptist as a medallion illustrates the throne that's been prepared for the Lord. In the apse, the Virgin is flanked by the two archangels. A medallion on her breast of the infant Christ symbolizes the Incarnation of Christ. The fresco is being prepared for the move back to Cyprus. 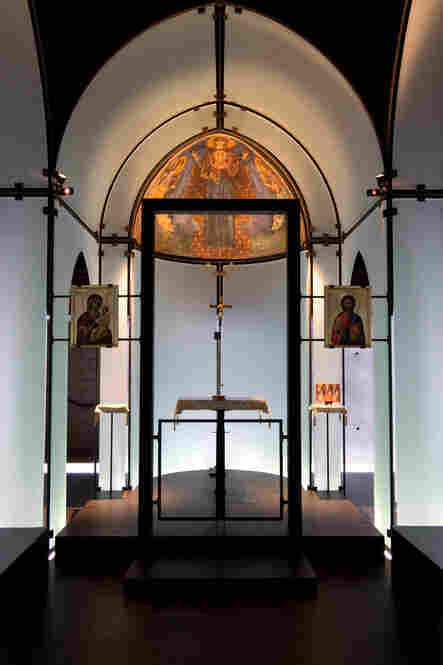 The glass and wood chapel that housed the frescoes was a church within a museum. 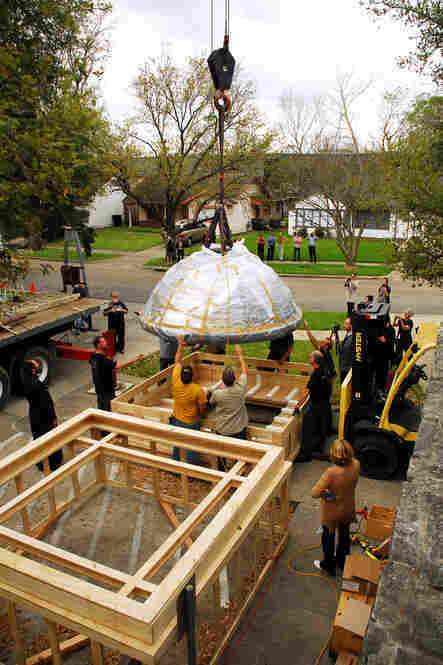 The 4,000-square-foot chapel was opened in 1997 and funded by the Houston-based Menil Foundation. The Rev. 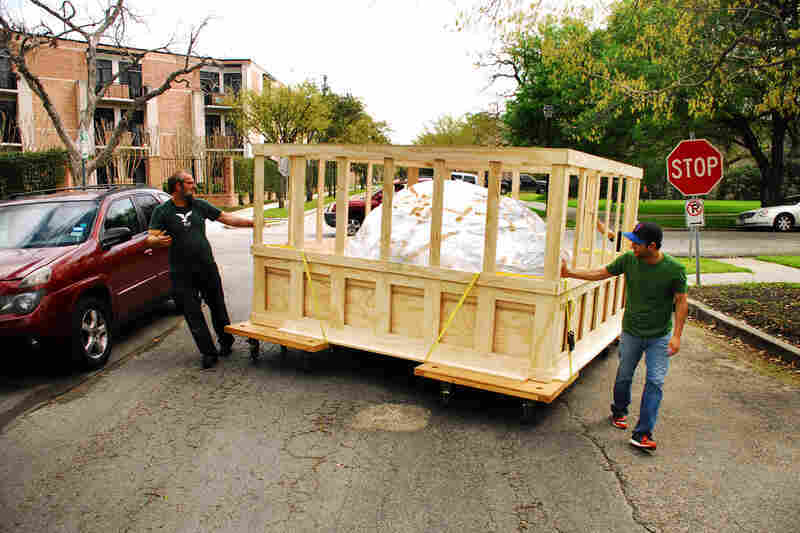 Demosthenis Demosthenous traveled from Cyprus to Houston to accompany the frescoes home. He says what's been stolen from Greek Orthodox churches is heartbreaking. The frescoes are prepared for shipment back to Cyprus. 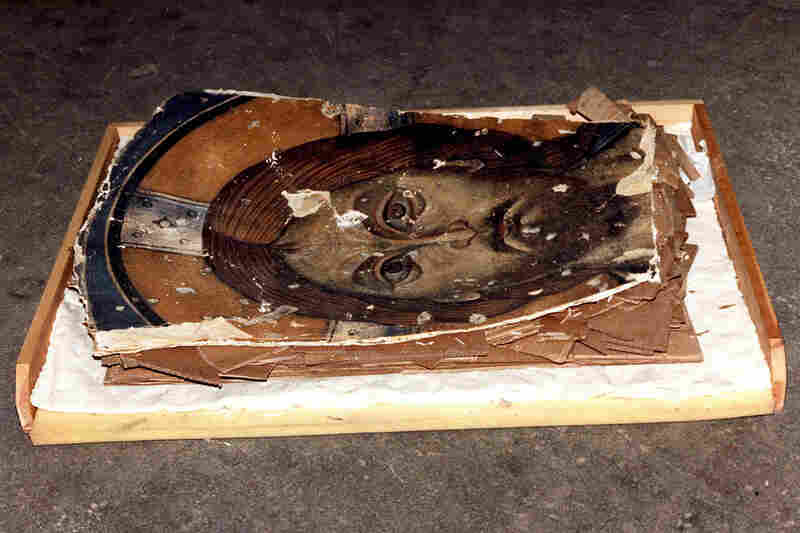 The fresco fragments were bought from the thieves by the French collector Dominique de Menil on behalf of the Church of Cyprus, the rightful owner of the frescoes, in exchange for the right to a long-term display. These frescoes were cut into 38 pieces and shipped to Germany by thieves, who tried to sell them in the arts black-market. 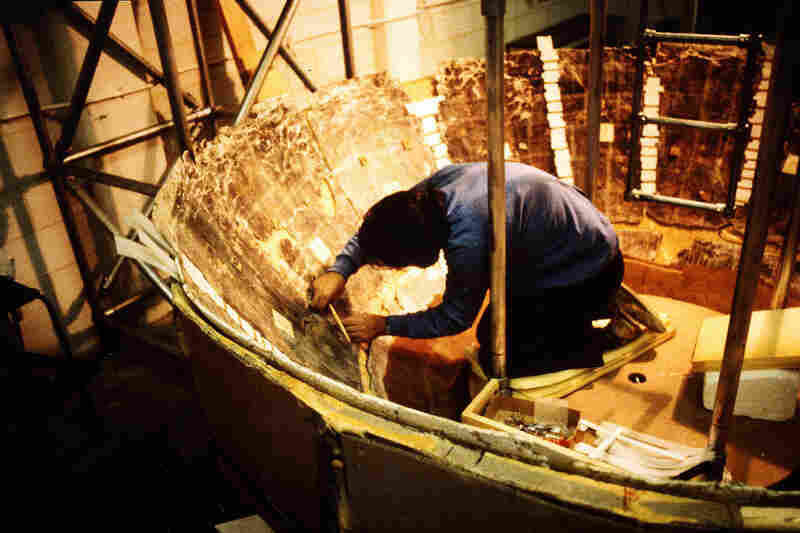 In 1984, the fragments were put in individual trays before being restored London. A conservator joins the fragments using specially designed scaffolding to work inside the concave dome. The frescoes were hacked with a chainsaw to remove them from the dome and apse of the chapel so they could be sold on the black market. The Menil Foundation funded a careful three-year restoration of the paintings. The reassembled fragments of the apse were painted to restore the losses created by the saw cuts in 1987. 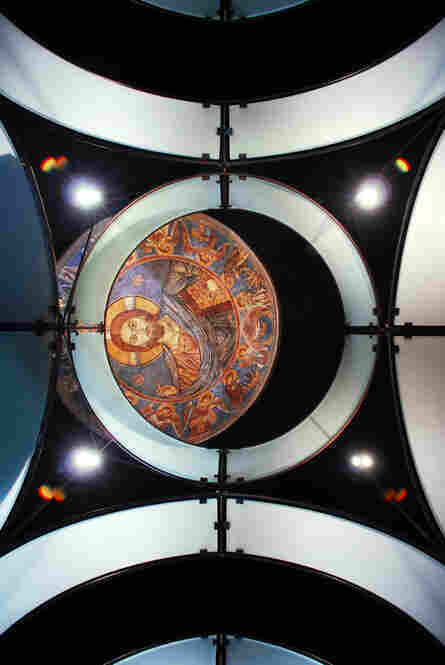 Cyprus' Archbishop plans to exhibit the works in the Byzantine Museum in the capital city of Nicosia. The frescoes won't return here to St. Evphemianos in Lysi because Turkey still occupies the region. A set of 13th-century Byzantine frescoes — plundered after Turkey invaded Cyprus and on display in Houston for the last 15 years — is headed home at last. It's the closing chapter in what turns out to be a remarkable odyssey. It all started in the summer of 1974, when the Turkish army invaded Cyprus and nearly 200,000 Greek Cypriots became refugees fleeing south. "And so all the churches and homes and art was left behind," says Josef Helfenstein, director of the Menil Collection in Houston. "And after years, some of these churches began to be looted." Hundreds of them, in fact, including a tiny 13th-century limestone chapel outside the small Cypriot town of Lysi. It took several years before somebody noticed the two incredible 800-year-old frescoes inside the Greek Orthodox sanctuary, but eventually somebody figured it out. 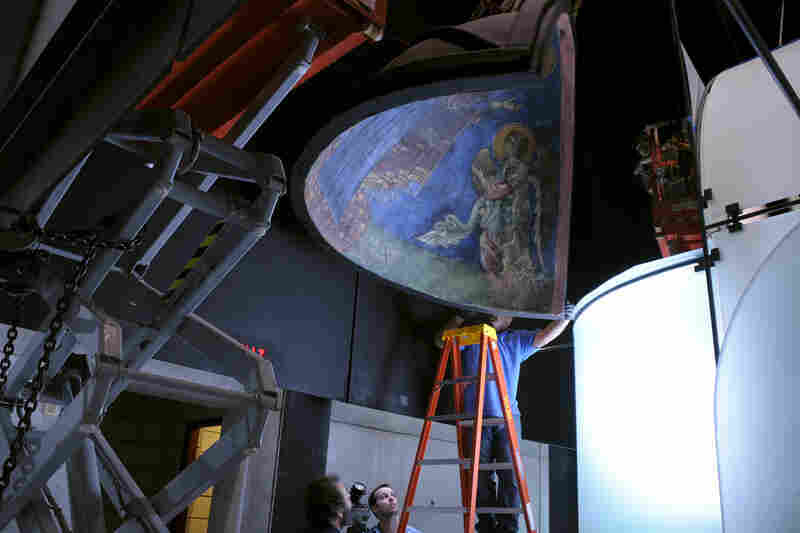 Thieves took a chainsaw and brutally hacked the frescoes out of the dome and apse — in 38 pieces. 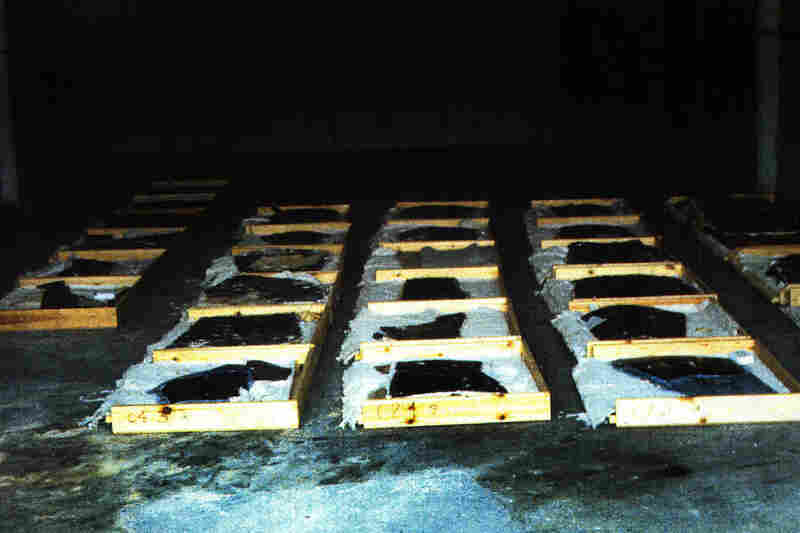 "The only way to get them out of there was to cut them into pieces," Helfenstein says. "And they were shipped to Germany." In Munich, a Turkish dealer offered them to Dominique de Menil, a noted collector and art patron. He claimed they'd been found in a private home in Anatolia, Turkey. Menil, standing in a warehouse in front of a set of chopped-up 13th-century frescoes, was pretty sure she knew better. "That was a lie," Helfenstein says. "And so Mrs. de Menil was very quickly suspicious — and she had very good advisers. She had a world-class specialist in Byzantine art." De Menil told the Turkish dealer she wanted to take pictures of the frescoes to look at while she pondered her decision to buy. But that was a trick; instead her researchers painstakingly tracked the frescoes back to Cyprus. It took more than a year. 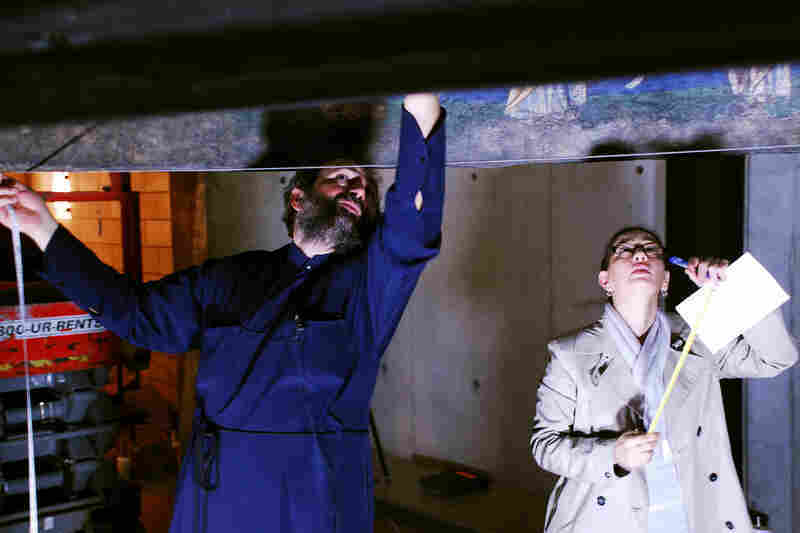 De Menil contacted the archbishop responsible for the looted chapel, offering to ransom the frescoes from the so-called "owners" and then restore them — at a cost of more than $1 million. In return, she wanted to display them in Houston for a while before repatriating them. The deal she struck, Helfenstein says, means "we are the only place west of Cyprus to have frescoes of that significance on display." For the last 15 years, the frescoes have been on display in Houston, in a $4 million chapel that was designed and built especially for them on the Menil Collection campus. Hundreds of thousands of visitors have worshiped there, listened to concerts and education programs, or simply sat in quiet appreciation under their gaze. But now it's time for the frescoes to go home, and the Rev. Demosthenis Demosthenous has traveled from Cyprus to accompany them. He says what's been stolen from Greek Orthodox churches is heartbreaking. "Twenty-three thousand icons dated from the 12th to the 20th century," he says. "Most were paintings, even mosaics. They are lost — and they are found all over the world." Demosthenous says what Dominique de Menil did stands as an example to the collecting world. 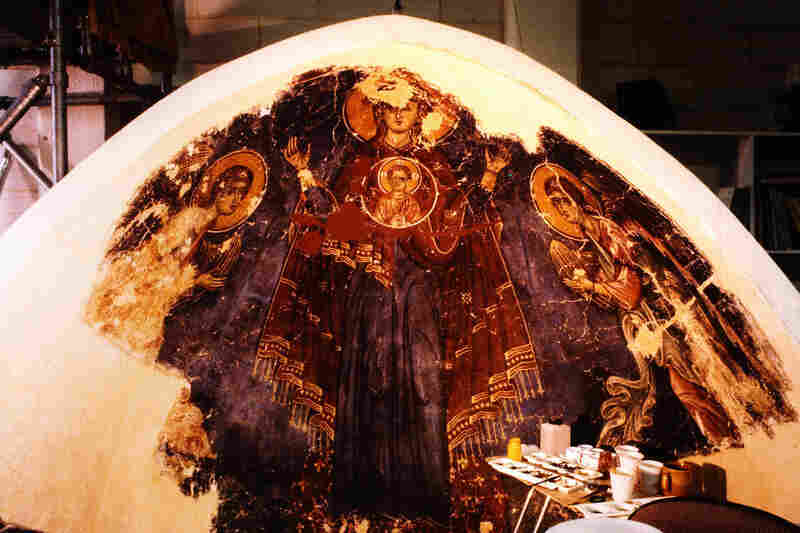 Instead of quietly purchasing the frescoes for her museum — in the guise of "rescuing them for mankind" — and then defending her acquisition against subsequent ownership claims, she negotiated a historic agreement with the Church of Cyprus. The black-robed priest beams as he talks, his smile lighting up his bearded face. It's his first time to America. "I am really very, very, very happy to be here in America," he says. "I always remember Neil Armstrong and Martin Luther King." And he remembers Dominique de Menil, who died in 1997. It's a short but strong list of favorite Americans. In these last few weeks of the frescoes' Houston life, visitors flocked to the Byzantine Fresco Chapel to see them before they left forever. The artwork will not go back to the small chapel outside Lysi where they'd lived for the last 800 years — it's still inside Turkish-occupied Cyprus. But they will be displayed about 40 miles away, in the archbishop's museum. There, they'll join other plundered artwork that's been rescued from around the world, but can't make it all the way home.